Specially treated waste material from electric power plants will soon be used to clean up oil in the Gulf thanks to the ingenuity of a University of Central Florida professor. 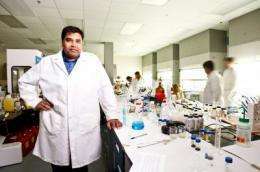 The National Science Foundation awarded Sudipta Seal a $67,000 grant that will help the professor turn waste material, commonly referred to as flyash, into a cleaning agent. Seal will modify the flyash so that it absorbs oil and can be delivered to a coal-burning facility and re-used. The flyash will be safe, preserve the oil's energy-generating capabilities and be reusable once the oil is burned off. "It's a completely green process very cost effective and easy to scale up," said Seal, who has been studying the characteristics of flyash for more than a decade as part of his research on rare earth nanoparticles. Seal is director of UCF's Advanced Materials Processing and Analysis and NanoScience Technology Centers and a professor of mechanical, materials and aerospace engineering. Larry Hench, a renowned ceramic materials professor who conducts special projects for UCF, will work with Seal to develop the flyash and prepare a process for deployment that can then be licensed to a commercial partner. They envision that the flyash will be retrieved from the water in a low-cost mesh packaging material and then transported to a coal-burning power plant or other facility where the oil will fuel production processes. The flyash has also shown the ability to clump oil that has already washed up on shore, enabling it to be easily collected and, again, re-used. Since the Deepwater Horizon spill began in April, NSF has funded 65 of the rapid response grants to researchers across the country addressing all aspects of the clean-up. The grants are deployed in times of natural or accidental disasters to quickly engage the world's best scientists and engineers to help search for solutions.